Editor’s Note: The combination of unusually cold weather and years of neglect have produced a nightmare this winter in Detroit. The excepts below, featuring comments from a veteran city plumber, illustrate the dire need for increased funding for repair of our aging water and sewerage systems.–Hardly Waite. 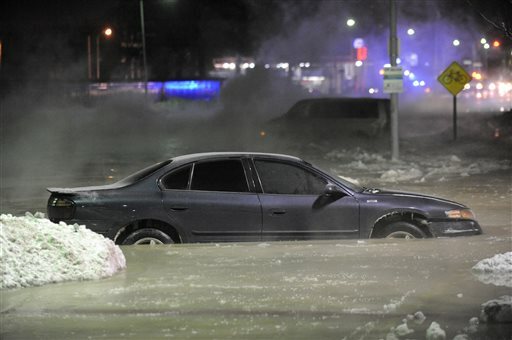 Water main breaks are causing major problems in cities in Michigan and across the country. Pontiac and Bay City in Michigan, as well as Atlanta, Georgia, are experiencing catastrophes as a result of water mains giving way. The water distribution infrastructure, like that of many US cities, can be over 150 years old in parts. The Society of Civil Engineers, which estimates there are 240,000 water main breaks per year in the US, concluded in its assessment, “at the dawn of the 21st century much of our drinking water infrastructure is nearing the end of its useful life.” The cost for replacing the aging infrastructure over the coming decades could reach more than $1 trillion, according to the American Water Works Association. Instead of meeting these pressing needs, last year, the Obama administration cut funding to water infrastructure programs. Concerning the maintenance of the infrastructure, Paraski continued, “In the late nineties they stopped the policy of going through and issuing contracts for water main replacements. It got to be where we wouldn’t fix them until they broke. We had a job—a main break—at Harper and Moross on the eastside. Every time we repaired it, cut out a section, put on a clamp and turned it back on, it would break again further in. Excerpted from World Socialist Web Site.